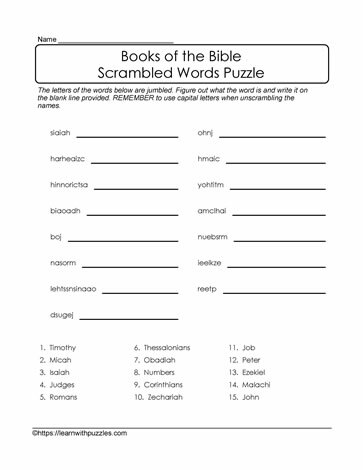 Scrambled Bible books puzzle. Here is list of scrambled words about the Bible to decode. Suitable for students in late elementary grades 4,5,6, and homeschoolers. Use this puzzle as an introduction to a unit on Bible books, or as an 'activating prior knowledge' activity for students. These printables can also be a discussion starting point about 15 books of the bible listed in the word bank. Can be used in the homsechooling environment, regular classrooms and church Sunday schools. Engage vocabulary building and problem solving skills with this downloadable puzzle.